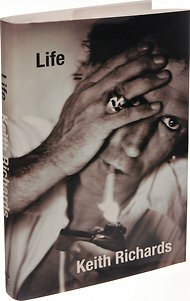 I had reason to revisit Life by Keith Richards ... what a great life. Keef's Life is incredible. Here's a review from the New York Times. Do the Stones mean anything to me? Hmmm. Following on after reading Life I came across this picture of Chuck Berry & Keith Richards. Keef admired Chuck heaps, but also got quite annoyed with him; (page 469): "I have stolen every lick he's ever played. So I owe it to Chuck to bite the bullet when he was his most provocative … and he sure pushed me hard … it was very difficult for me to allow myself to be bullied, and that is what Chuck was doing to me and to everybody else." Yet, he then says (p. 470): "Dear Mr. Berry… despite our Ups and Downs: I love you so! Your work is so precious & beautifully timeless. I'm still in awe …"
Me too. (He's such a treasure, that Keef.) Anyway, awsomepeoplehangingouttogether is a lot of fun.